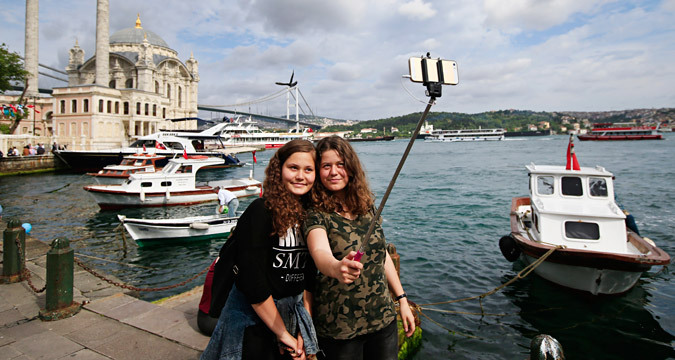 Russian tourists taking a selfie in Istanbul. Increased tourism points to resumption of relations between the countries. Relations between Turkey and Russia have started to recover according to Turkish Minister of Culture and Tourism Mahir Ünal. The minister expects that the number of Russian tourists visiting Turkey this year will reach 2.5 million people. "I believe that some 2.5 million Russians visit Turkey (in 2016), as our relations with Russia have already begun to recover,” Ünal said on April 5 while delivering a speech in the Turkish Parliament. Ünal mentioned that Turkey's tourism sector revenues are expected to fall by about 20 percent in 2016 when compared to the previous year. He added that Turkey would also try to reduce their losses by attracting more Iranian and local tourists. This decrease in tourism is associated with the threat of violence in Turkey after a series of terrorist attacks, as well as the crisis in Russian-Turkish relations. The number of Russian tourists visiting Turkey in 2015 fell by 18.6 percent compared to 2014, totaling 3.65 million visitors, according to the Ministry of Culture and Tourism of Turkey. Turkey was visited by 36.24 million foreign tourists in 2015, or 1.6 percent less than in 2014. There was a sharp decline in the number of tourists from European countries. The tourism sector is very important for Turkey's economy representing about 4.5 percent of the country's GDP. It plays a big role in reducing the balance of its external deficits.